If you ask an ardent Trump supporter, Senator Dean Heller (R-NV) is a RINO who plotted to save Obamacare and otherwise serve as a minion to Democrats. 💥Pro-Trump candidate . @DannyTarkanian to challenge Dean Heller in #NVSEN primary! If you ask ardent Left-wing Democrats, he is Donald Trump’s BFF who is trying to not only destroy Obamacare, but kill off the poor (women and minorities hardest hit, of course)… a view which had led to a man being arrested for burgling Heller’s campaign office and even threatening his life. 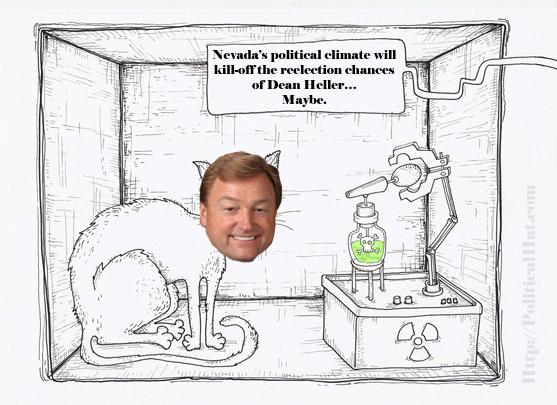 Dean Heller, then, is like Schrödinger’s preverbal cat, being simultaneously two things at the same time. Could Heller parlay this into a campaign that identifies him with an independent centrism? Perhaps, but the partisan primary electorate will be unfavorable to him. However, the Republican electorate is more distributed throughout the state, with much more strength in northern Nevada, which still has a bias against southern Nevada candidates when they have a northern Nevada alternative to vote for. So yet again Heller is both doomed and saved, and will remain so until the election, when the box lid is opened. This entry was posted in Elections and tagged Nevada, NVSen. Bookmark the permalink. But most voters don’t think strategically about this stuff. Kill off the poor? The GOP had it all in 2000. Oddly, the poor weren’t gassed. No mass deaths reported. Oh and the MSM sure as hell would report them.